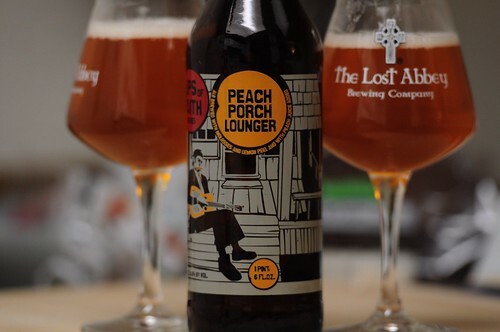 New Belgium Brewing Lips of Faith Peach Porch Lounger, originally uploaded by adambarhan. A: Pours an orange body with slight golden tints to it with a small off-white head that has decent retention. A small cap forms on top and bits of lacing cling to the glass. S: Some light peach upfront with a malty sweetness on the back, presumably from the molasses. Slight funk mixed in. T: More peach in the beginning mixed with a bit of citrus. This is followed up by a pretty heavy malt sweetness. There is a bit of straw/mustiness mixed in as well. O: Not a bad beer, but was hoping for a bit more in terms of the peaches. The entire time I drank it, I wanted the beer to be much more sour as well.